Edited to add: It has come to my attention that this method of cleaning the case results in any logos or printing on the rubberized surface being removed as well. So unfortunately NARS logos on the compact will be affected. However other brands that don't print designs or logos on the rubberized portion of the compact, like Smashbox or Becca, should be unaffected. I have been told that using a silicon-based lubricant instead of alcohol to clean the casing helps to solve this problem. I've tried cleaning a sticky NARS case with silicone powder to good effect, do read the post if you're interested in an update! Every girl who has had a NARS item for long enough will know that the sleek, rubberized NARS packaging will eventually become a hot, sticky mess - literally. The plastic starts melting and it basically becomes tacky goo that picks up a lot of dust and is sticky to the touch. And for some reason, it has been my experience that hot, humid climates tend to accelerate the degeneration of rubberized packaging. Often, when this happens, people resort to depotting (removing the metal pan from the plastic packaging). Fortunately, there is a fast and easy way to restore the packaging to non-stickiness that does not require you to depot. NARS, of course, is not the only brand to use such rubberized packaging. After all, if it looks cool, everyone's going to do it. Smashbox also uses identical material for their packaging, and Becca uses something similar, so here, I'm going to show you how to clean up a sticky compact using a Smashbox case. As long as the material is made out of the same type of rubberized plastic material, this cleaning method will work. Yes, it was horrific. It was gross, sticky, and everytime I touched it, my fingers would come off with gooey residue. It needed cleaning, stat. Before I start, I'd like to mention that two of the more popular methods I've been seeing around - baby wipes and water - don't really work when your NARS or Smashbox case has disintegrated to this level. (Trust me, I've tried.) Both are good for cleaning off the dirt when the case is just dusty but hasn't gone sticky yet. However, once your case has degenerated and becomes sticky to the touch, neither method is particularly useful. In order to clean your compact, you need alcohol. And I'm not thinking of booze, I'm thinking of isopropyl alcohol. If you're in the USA, rubbing alcohol is sold by the bottle, and it's relatively easy to get one. If you're in the UK or elsewhere, isopropyl alcohol isn't usually sold by itself, so you'll have to settle for surgical spirit, or a similar alcohol-based surgical disinfectant. It may not be isopropyl alcohol, but usually as long as its some sort of alcohol it will do the job. Just make sure the alcohol content is decent - I normally suggest 70% alcohol and above. You'll notice the alcohol will somehow remove the stickiness from your casing, leaving only behind a shiny plastic surface. It seems like the ispropyl alcohol somehow dissolves the top rubberized layer that was getting sticky, but left the underlying plastic casing untouched. 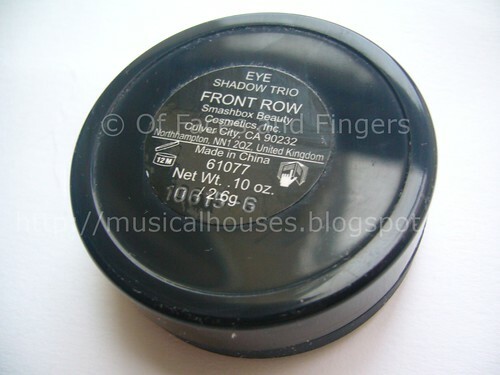 After a few wipes, this is what your new-and-improved NARS or Smashbox case will look like. Look ma, no stickiness! However, there are going to be issues with this packaging that will make some people unhappy. For one, it changes the surface of the packaging. Before, the packaging was rubberized and matte in finish, but after cleaning, because the alcohol dissolves the rubberized bits, the casing that is left behind is a shiny black casing that's plastic but not rubberized. 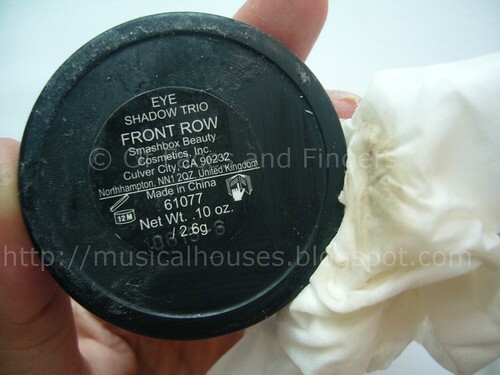 I guess this is how NARS, Smashbox and all the lot of them make those casings that look so cool - they get cheap black plastic containers, and coat them with some sort of rubbery material to get that matte finish. So it seems to me like it's the rubbery coating that gets sticky over time, not the plastic beneath it. Wiping the compact with alcohol removes that rubbery top surface. I know some people dislike this cleaning process because they think it cheapens the look of the compact. That may be true, but if you ask me, I'd rather have a clean but shiny (if slightly cheap looking) than a sticky rubberized compact that grossses me out each time I touch it. Of course, it's all a matter of preference, but I've yet to discover a method that removes the stickiness without removing the rubbery layer. I'm hoping I'll eventually find one! But in the meantime, at least I can make sure that my NARS and Smashbox compacts can cleaned and usable again, without having to depot them! very interesting! since mine aren't sticky yet, I'm going to try the wipes first (never thought of that) but I'll grab the alcohol if necessary! oh lovely! you just saved a lot of my cases. Thank you for this tutorial! I finally bought some NARS products although I hesitated because I kept on reading about how gross the compacts get. I actually do not like the rubberized casing that it comes in. Great tip. Thankfully, none of my NARS or Becca items have gone sticky yet. Thank you so much for this tip! So many of my NARS compacts are disgustingly gross. I'm going to try this tomorrow. Thank you so much for the tip! My cases are still good looking yet. The Smashbox cases are a little dusty. First I will try the wipes. Hi, I found your blog through the Beauty Blog Link Love. Anyhow, there is a way to properly clean these without removing the finish. You need to wipe them with silicone - basically you will find this in the form of silicone based lube, such as Eros. This not only cleans but also conditions rubber and latex, shining and smoothing the finish. I had some Nars products that got all gunky but I didn't want to lose my rubberized finish (I'm a wuss that way! haha) so I tried using the Dettol wipes first...and it worked! There were parts that I had to scrub really hard, but I managed to get them back to new(ish) and kept the rubbery surface. I have three items from NARS and am havbng the same problem. I will never buy NARS again. I tried their lipgloss in Turkish delight and it selled bad. NARS is just plain narsty! I just wanted to say that the Anonymous post from December 20th was right on the mark. Thanks! It's definitely better than stripping the entire rubberized part of the casing (unless of course that's what you want!). Hope this helps! Love The Eueshadows. What R The Names?? 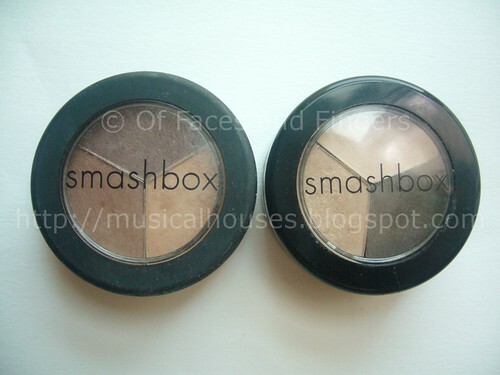 @Cindy Cortez: They are both Smashbox eyeshadow trips, one is Front Row, the other is (if I recall correctly) Cover Shoot. Hope this helps!